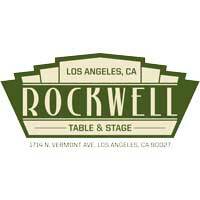 Located in the heart of Los Feliz Village, Rockwell: Table & Stage offers Angelenos a truly unique experience by staging live, musical performances all the while serving unwavering cuisine with seasonal alternating menus. With a newly renovated indoor supper club and bi-level open-air patio restaurant, the entertainment destination attracts a dynamic crowd seeking the ambiance of a relaxed, yet cutting-edge community. Baroque chandeliers and dark rustic furniture fashion a warm indoor eatery and performance space, while a robust California Coral tree and flourishing vegetation set the scene for a lush, outdoor dining experience.